Ready? Massage onto wet hair and then rinse thoroughly. Repeat application and use daily. 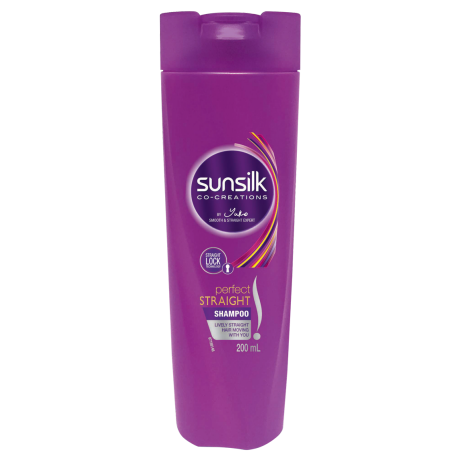 For even more incredible hair, why not combine it with Sunsilk Perfect Straight Conditioner? Water, Sodium Laureth Sulfate/Sodium C12-13 Pareth Sulfate*, Cocamidopropyl Betaine, Dimethiconol, Hydrolysed Silk, Mineral Oil, Glycerin, Peg-45M, Carbomer, Guar Hydroxypropyltrimonium Chloride, Tea-Dodecylbenzenesulfonate, Tea-Sulfate, Cyclotetrasiloxane, Synthetic Fluorphlogopite, Tin Oxide, Sodium Chloride, Citric Acid, Disodium Edta, Sodium Benzoate, Phenoxyethanol, Fragrance, Ci 77891. *Used Interchangeably. This shampoo and conditioner work really well for my hair and I’ve been using it for a long time. I can’t find it anywhere to buy anymore, what’s going on? I’m in NSW and not going to order from NZ countdown (used your website buy now search). help! This stuff actually keeps my hair straight and frizz free and with the conditioner too. However, I can no longer find it in the shops. pls help. I need it.